Wednesday Wish List: Topshop Gift Ideas! I normally do a Wednesday outfit wish list but thought this week I would change it up a little and have some ideas of presents to buy someone that will act as a filler to the larger present or just some bits to make up one big awesome surprise box. I love adding bits and bobs to presents rather than buying one large one or one expensive one. I used the Topshop website to find a few things I thought I would buy to add to someones present for their birthday or maybe Christmas, which isn't that far away. I wont be planning for Christmas just yet even though I adore everything about Christmas! I chose the cute lady bug ring as you just cannot want this in your jewelry set? I then chose the Candy Kittens cook book as I am obsessed with the great British bake off at the moment and find that all the yummy treats in this book would make a perfect present for someone! HINT HINT! <3 jokes aside I do think it is super cute and I love to bake and make yummy treats so this would be a great present to someone you may know that has a big sweet tooth or just loves Jamie Lang! I know I love Made In Chelsea and cannot wait for it be back on our telly! The tangle teezer is great, I own one and would recommend it to anyone. I find my hair hard to manage sometimes and this just makes it super easy to smooth out my hair without hurting my head! I keep mine in my hand bag and its perfect especially with the cute design. Last but not least I love this mustache air freshener I nearly bought it myself the other day for my car. 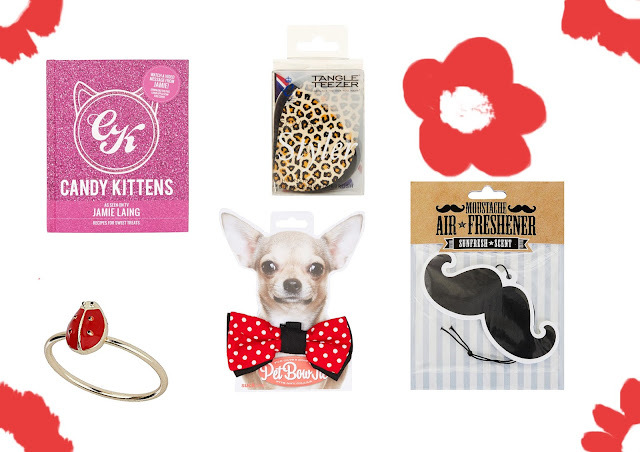 Its cute and who doesn't want a mustache air freshener ey? What would you add to a present ? I really want another tangle teezer, I had one years ago when they first came out and have since lost it!